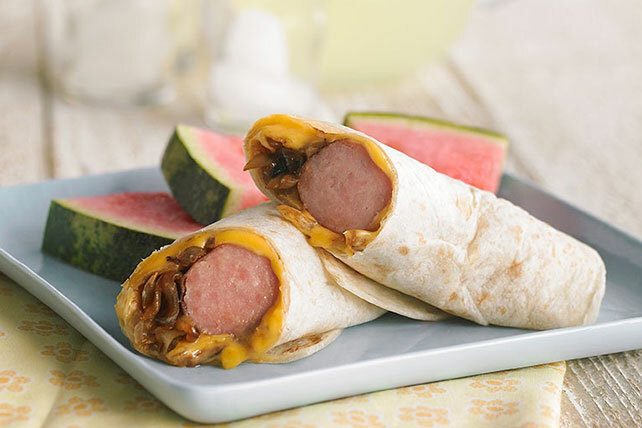 Try something new with our Bratwurst Wraps recipe! Grilling the precooked bratwursts just until browned helps give our delicious Bratwurst Wraps their authentic flavor. Heat oil in large skillet on medium heat. Add onions; cook and stir 5 min. or until golden brown, stirring frequently. Cover; simmer on medium-low heat 10 min., stirring occasionally. Meanwhile, grill the bratwursts 4 to 5 min. or until lightly browned and heated through, turning occasionally. Add A.1. to onions; mix well. Top tortillas with Singles pieces, bratwursts and onions; roll up. Prepare using KRAFT Swiss Singles. Substitute 4 split submarine or French bread rolls for the warmed tortillas.